Lawsuits Target 'Debtors' Prisons' Across the Country Civil rights lawyers are challenging the use of court fines and fees against people who can't afford to pay. This week's ACLU suit against Biloxi, Miss., is the sixth such case since September. Qumotria Kennedy, 36, stands at the baseball field in downtown Biloxi where she worked as a contract maintenance employee. She's a plaintiff in an ACLU lawsuit accusing the city of operating an illegal "debtors' prison." Biloxi is the latest city to be sued. Nusrat Choudhury, an attorney with the American Civil Liberties Union who filed the lawsuit, charges the city runs an illegal "debtors' prison" when it puts indigent people in jail without adequately trying to determine whether the person has the means to pay court fines and fees or without then offering adequate alternative ways to pay off a fine, like being offered the chance to do community service. "We believe the ACLU is mistaken about the process in Biloxi," Vincent Creel, a spokesman for the city, says. "The city of Biloxi treats all defendants fairly under the law." Qumotria Kennedy, the lead plaintiff, questions that. She says she was arrested in July when she was a passenger in a car driven by a friend. The women were on their way to pick up their teenage daughters when a police officer stopped the car, saying the friend ran a stop sign. The officer asked both women for identification and a check showed an outstanding arrest warrant for Kennedy. She was arrested, handcuffed and spent five nights in jail before she appeared before a judge. 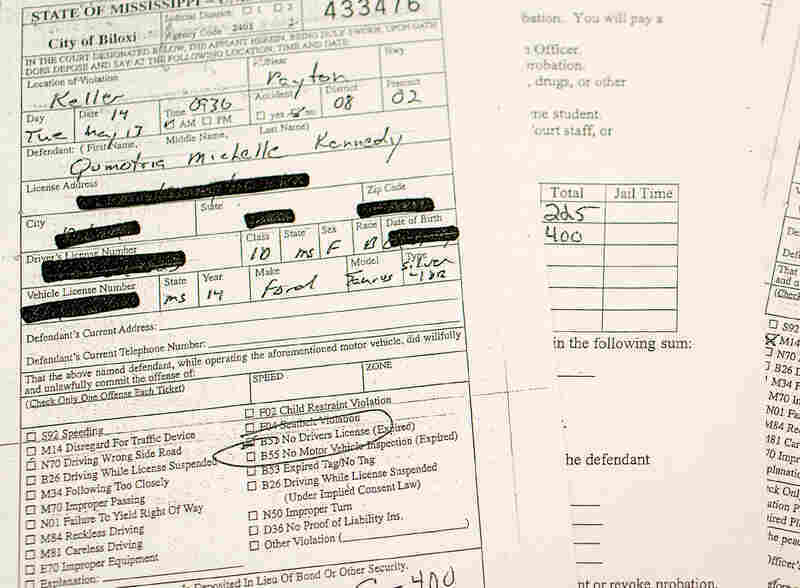 She owed $1,000 on unpaid fines and fees from an earlier traffic stop, two years prior, when she was caught driving without a license or insurance. She says she wanted to pay but didn't have the money. Kennedy, a 36-year-old single mother of two, works sporadically whenever she can find cleaning jobs. She had a part-time job at a motel but lost it when she missed work while in jail. 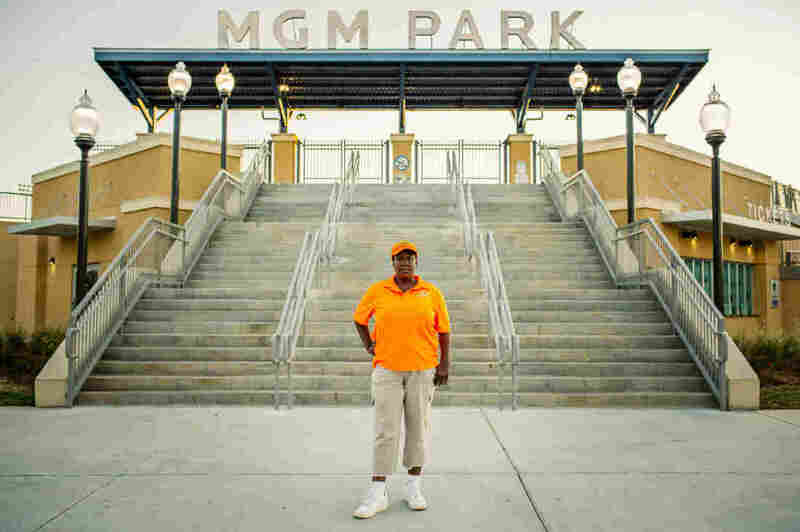 After her release, she got occasional calls to clean the ballpark after Biloxi Shuckers games, but now the baseball season is over. She still has outstanding court fines and worries that the city will issue another arrest warrant. "It's scary," she says. "You have to sit there and worry, wondering over your shoulder if you're going to get picked up this day, if you're going to get picked up that day. It's a really upsetting feeling. If I can get the money, I will pay for it. But I can't give nothing that I don't have." 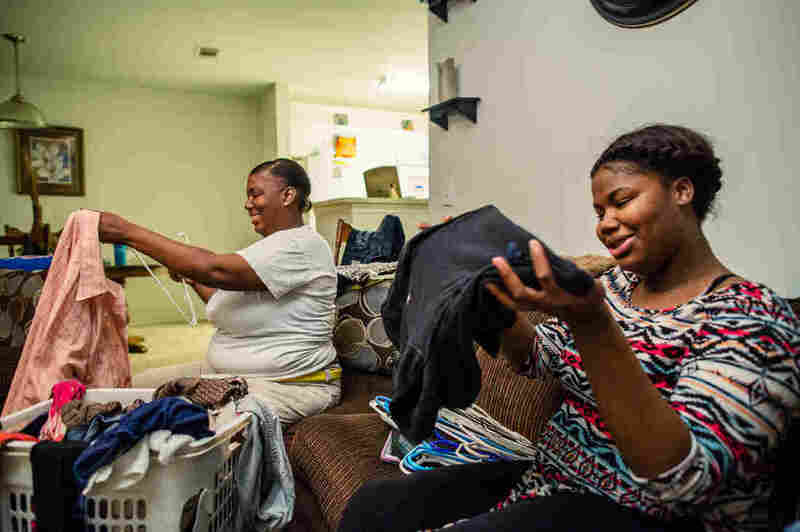 Kennedy and her daughter Victorya Ricks, 17, fold laundry at her home in D'lberville, Miss., a 10-minute drive from Biloxi. City officials say they offer alternatives like community service. But Kennedy says it was not offered to her and when she found out about the option, she says, her probation officer discouraged it. Joseph Anderson, Kennedy's boyfriend, who is also a plaintiff in the ACLU case, says he was at home when police came to his door to arrest him on a warrant for an unpaid $170 speeding ticket. 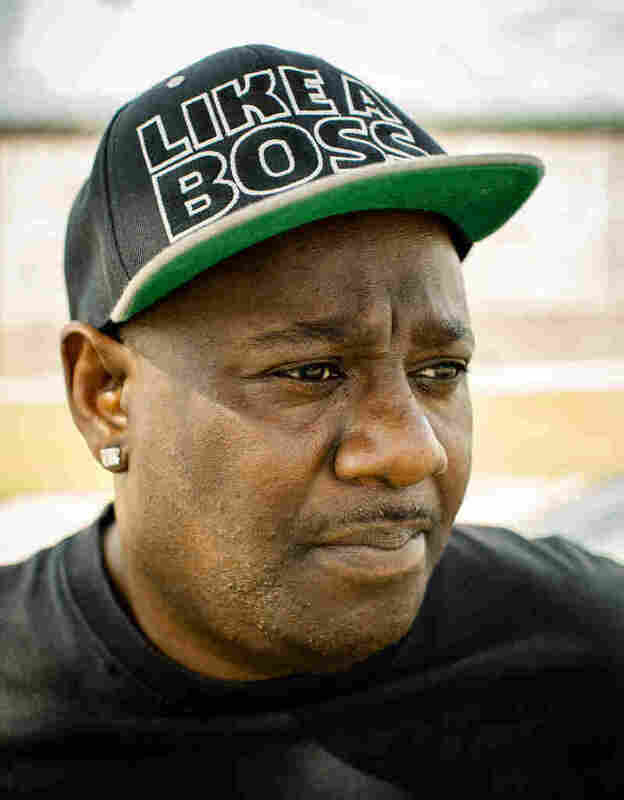 Anderson, 52, is disabled from multiple heart attacks and a stroke. He cannot work and lives on a disability check. He spent seven nights in jail. "People are being arrested in their homes or at a traffic stop, told that they need to pay money," Choudhury says. "They're never informed of their right to a lawyer. They're not given a court hearing until they've been jailed for days, sometimes weeks at a time." Choudhury says these court fines and fees set up an unequal system of justice. She says people with money pay their court fines and are done with the court system. But people who are indigent, unemployed, homeless or living on disability checks are put on payment plans. Those often come with added fees. If they don't keep up the monthly payments, they can go to jail, putting them further into debt. "People like Miss Kennedy," says Choudhury. "A single mom, who is struggling to find work and then loses her job — her part-time cleaning job — when she's jailed for being poor." Also this week, the Southern Poverty Law Center filed a complaint against a judge in Alabama who gave impoverished people who owed court fines a choice: Go to jail or donate blood at the bloodmobile across the street. Choudhury says lawyers are filing more of these cases as the issue gets more attention. A key moment came in March, when the U.S. Department of Justice released a report highly critical of such court practices in Ferguson, Mo. There are also more lawsuits because lawyers are starting to win. The ACLU settled a case in March in DeKalb County, Ga., over the jailing of Kevin Thompson, a teen who could not pay nearly $1,000 in fines and fees from a traffic case after he was caught driving without a license. The settlement led to new court procedures and more access to public defenders. And Alec Karakatsanis, of Equal Justice Under Law, brought class-action suits that led to change in Jennings, Mo. — next door to Ferguson — and in Montgomery, where a related case was also settled by the Southern Poverty Law Center. "We're showing that when you bring these things to the attention of the courts, they will vindicate federal constitutional rights," Karakatsanis says. "And the way that many of these local jurisdictions have been running their court systems is blatantly unconstitutional. So now we're seeing a growing awareness that these issues can and should be treated like the emergency that they are." In the audio of this story, as in a previous Web version, we say Nashville, Tenn., is among six municipalities against which lawsuits have been filed. While such a lawsuit was filed in Nashville, it was actually against Rutherford County, Tenn.